This is the last of the items on the airport that have been queued up. Spokane’s level of passenger growth is higher than the national average of 3.6 percent, Woodard says. The Spokane Regional Chamber of Commerce’s air service marketing task force has been trying to reestablish nonstop service to the Bay Area for the past several years by talking to representatives of major carriers, such as Alaska Airlines and American Airlines, says Rich Hadley, the chamber’s president and CEO. He says the airport’s current passenger numbers indicate a strong economy, which could be boosted by increasing traffic to the Bay Area. via SIA expects to soar to record | Journal of Business | Find Articles at BNET. No kidding! VC money has dried up in Spokane. My contacts say if you want VC investments, you need to move to Vancouver, Seattle, Portland or the SF Bay area. Rich Hadley, president of the Spokane Regional Chamber of Commerce, e-mailed 130 companies in the region and asked them to consider the negative impacts of the canceled flights. via The Spokesman-Review.com – Let’s tell United we stand together. The last sentence is, in retrospect, funny. Apparently they did consider the negative impacts of the canceled flights. Agilent and World Wide Packets, mentioned in the story, closed their Spokane operations, as did numerous other high tech companies. Certain classes of workers need to travel – including high skilled, highly educated sales and marketing, engineering, science and other staff. Other classes of workers do little business travel – warehouse workers, blue collar manufacturing including construction, retail sales, restaurant and hotel workers, and work that must be done locally, such as health care. Which kind of workers is Spokane left with? Spokane International Airport (GEG) has become a major aviation hub for Eastern Washington and Western Idaho. Increased airline flights, an expanding aerospace business park and an $82 million capital expansion program in progress have spurred recent growth. By the end of 2008, the capital improvement program is expected to generate a ripple effect in the region, creating 3,246 direct and indirect jobs and infusing $203 million into the area’s economy, according to an airport study. In fact, the area lost 15,000 to 20,000 jobs since 2008. Undoubtedly, even with dropping usage, the airport “saved or created” (hence immeasurable) 3,246 direct and indirect jobs. Righto. In 2005, the SIA marketing director said strong airport growth reflected the strong local economy. In 2005, the Chamber of Commerce (now named Greater Spokane, Inc) president said “current passenger numbers indicate a strong economy”. In 2005, SIA and GSI said Spokane needed more flights to the SF Bay area to boost our local economy. How will they spin this? They told us in 2005 and 2006 that the airport was a proxy for Spokane’s economic situation. In 2011, the airport is still a proxy for our local economy and what it says is the local economy has crashed and burned. REMINDER: The airport is a proxy for the local economy. The fall off in flights, non-stop destinations and passengers is primarily a reflection of the local and national economy . The data suggest that Spokane’s economy is doing worse than elsewhere. The data presented do not mean that airport management is (presently) doing a bad job, although their PR spin is amusing. Update: Since this was written, Alaska/Horizon announced it will add 2 additional turbo prop flights to the Spokane-Seattle route. Alaska did not publicly announce their price hike, but in their reservation system, the price went up. The airport situation, as you will see in the next post coming after this one, is an important barometer for Spokane. Or may be altimeter would be a better metaphor. 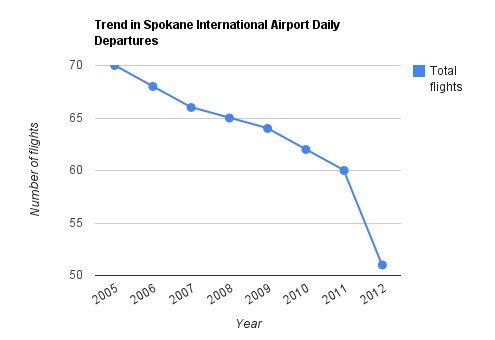 In January 2012, there will be a estimated 51 daily departures from Spokane. (Update: 53 now). 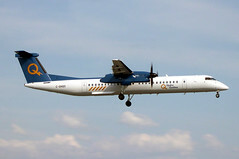 23 25 of those flights will be flown on turbo props (propeller) aircraft (1315 on Alaska to Seattle, 5 on Alaska and 5 on Delta to Portland) like the one shown here. 3 will be flown on smaller CRJ700 or 900 jets to Salt Lake City on Delta. About half of the flights departing Spokane will be flown on propeller planes. Doesn’t bother me but the flying public prefers to fly on jets. Turbo props are known for their cramped seating and less leg room. An informal survey by Delta recently found that its passengers hate turboprops so much that most are willing to drive two to five hours to avoid flying in them. 5 hours drive to Seattle anyone? What that means: The airport is in a spin, as in like a plane that has stalled and spun, headed towards the ground, and not as in PR spin. 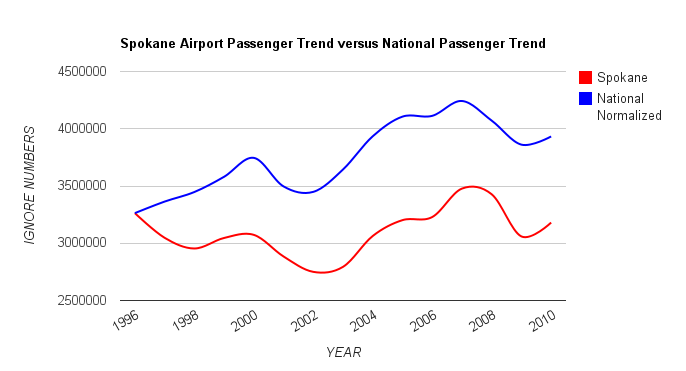 Trend in passenger growth (or loss) at Spokane “International” Airport versus Total National Air Passengers. In this chart, the national total has been re-scaled to start at the same point as the Spokane total in order to compare the local growth rate (or loss) with the national growth rate in air travel. The data for Spokane come from SpokaneAirports.net and the national data comes from the U.S. Bureau of Transportation Statistics. Ignore the Y-Axis numbers as they are meaningless in the trend comparison due to re-scaling. The start date of 1996 is because that is the oldest data available at the Bureau of Transportation Statistics. The end date is 2010, the most recent full year of data. Compare the starting point of the blue line to the ending point of the blue line. As you can see, national air traffic has increased over this time. Compare the starting point of the red line to the end point of the red line. Passengers at Spokane “International” Airport have gone down over this period while overall national air passenger levels have gone up. Only in the period of about 2005 to 2010, does Spokane perform better. 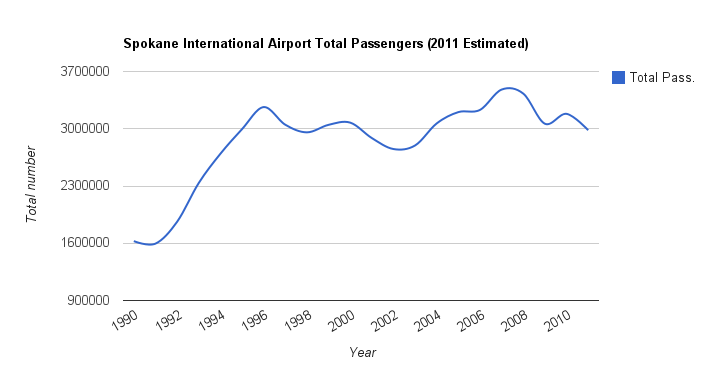 However, so far in 2011, Spokane has gone down while national air passenger counts have gone up by about 2%. 2011 is not shown in the chart. This chart was added to the previous post to keep the charts on SIA performance (or lack thereof) in a single place. If this source is correct: Spokane average and median listing prices – Trulia.com. See prior post for how the number of flights and destination cities list was determined. There could be slight variations in the numbers used or estimated. Actual data points for 2004, 2005, 2011 and 2012. In between values pro-rated estimates. First two charts are through January 2012. Actual data points for 2005, 2011 and 2012. In between values pro-rated estimates. 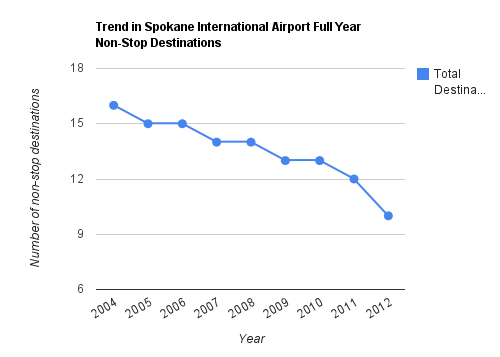 Data values from from SpokaneAirports.net with 2011 estimated from first half year trend. Data for 2011 is estimated using passenger levels through June of 2011. Interpretation: Compare the starting point of the blue line to the ending point of the blue line. As you can see, national air traffic has increased over this time. Compare the starting point of the red line to the end point of the red line. Passenger load at Spokane “International” Airport has gone down over this period. The publicly funded downtown Central City convention center expansion was going to increase visitors to Spokane. How did that work out? Update: The convention center expansion did not deliver on its expansion promises. Later this year, charts and data will be provided to show what happened. Boise chamber downplays effects of Southwest cuts | Boise, Garden City, Mountain Home | Idaho Statesman. Boise, like Spokane, is losing Southwest flights. Their Chamber of Commerce – equivalent to Spokane’s Greater Spokane, Inc – is spinning this as having “minimal implications”. Yet the first comment and others on the article say the changes make Boise a difficult place for business. Update: Since this was written, Alaska/Horizon announced it will add 2 additional turbo prop flights to the Spokane-Seattle route. Alaska did not publicly announce their price hike, but in their reservation system, the price went up..
Southwest to abandon Seattle-Spokane route – Spokesman.com – July 27, 2011. Claim: Airport spokesperson says there are 20 daily flights on Alaska/Horizon to Seattle. Reality: There will be 3 jet flights and 13 turbo prop (propeller planes – just like a rural town) direct to Seattle. That’s 16, not 20. Four additional flights go to Portland where you can change planes, then go to Seattle. Total travel time including TSA groping and so on is longer than just driving. This is easy to check at Alaskaair.com. Claim: The airport spokesperson says Alaska is not raising fares. Reality: On the Alaska web site, their lowest cost fare option vanishes in January the day before Southwest flights end. This is easy to check. Claim: The article says an expansion of flights “to Denver in recent years” adds more options. Reality: Except there appears to have been a 1/3d drop in flights to Denver this past year. Again, easy to check. Claim: The airport spokesperson suggests Spokane travelers can fly to “Denver and Phoenix” and then transfer to Seattle. Reality: That does not pass the giggle test – that takes far, far longer than just driving to Seattle! We are not idiots. PR spin or outright lies? You decide. Many are looking at the air travel situation and realizing we may need to move out of Spokane. It takes a day to get places that I used to get to in 2 to 2 1/2 hour flights, and with lack of options, I may have to stay over an extra night in a hotel. Filed under “Crime” because the airport is being dishonest. Separately, the SR reporter /editor should have verified or clarified those statements for the reader.